There are four trim level choices for the 2019 Honda Passport and they are the Sport, EX-L, Touring, and Elite. All four trims get equipped with a 3.5L V6 engine and a 9-Speed Automatic Transmission for efficient performance. A cabin with spacious seating for five people and flexible cargo and passenger space makes it easier for you to get more done in a day without stressing about having enough room for everything and everyone. The interior of the 2019 Honda Passport also gets loaded with all of the latest and greatest technology and safety features for an enjoyable and worry-free ride wherever you go. 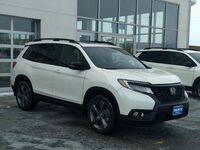 Check out all the specs and features of the 2019 Honda Passport below and the 2019 Passport is waiting for you to take it for a test drive today at Van’s Honda in Green Bay, WI. 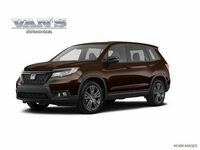 What are the Specs & Features for the 2019 Honda Passport? The 3.5L V6 engine of the 2019 Honda Passport provides 280 horsepower, 262 lb-ft of torque, and a 5,000-pound max tow rating while working with All-Wheel Drive (AWD). AWD is an option for the first three trim levels and it comes standard on the 2019 Honda Passport Elite. When equipped with standard Two-Wheel Drive the 2019 Honda Passport can tow 3,500 pounds. An Eco Assist™ System, Hill Start Assist, and Active Noise Cancellation all come standard on the 2019 Honda Passport as well. There is 115.9 cubic feet of standard passenger volume in the 2019 Honda Passport along with 41.2 cubic feet of standard cargo space behind the 2nd-row seat and when the 2nd-row seat gets folded down the 2019 Passport can handle a maximum of 77.9 cubic feet of cargo. 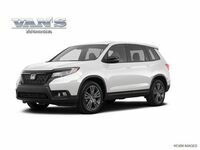 The top three trim levels of the 2019 Honda Passport get equipped with leather-trimmed seats and the EX-L trim adds heated front seats while the Touring and Elite trims get heated front and rear seats and the Elite also has ventilated front seats. Standard technology features for the 2019 Honda Passport include a 5” color LCD screen with a 7-speaker stereo and Bluetooth® connectivity. An 8” color touchscreen display with Apple CarPlay™ & Android Auto™ comes standard on the EX-L, Touring, and Elite trim levels. The Honda Satellite-Linked Navigation System and a 540-watt 10-speaker stereo with subwoofer is standard equipment for the Touring and Elite trim levels. All trim levels of the 2019 Honda Passport receive a Multi-Angle Rearview Camera, a Collision Mitigation Braking System, a Road Departure Mitigation System, Forward Collision Warning, and Lane Departure Warning. You can take the 2019 Honda Passport for a test drive today at Van’s Honda to see all of the standard and available features of the 2019 Passport.